Planking, which reached its pinnacle in July 2011, was seemingly fading from cultural consciousness, abandoned for more serious concerns such as teapotting, batmanning, and queening. The National Planking Association blog had been inactive since July of 2013, and what was once a flourishing community of photo fadders was now absent, finding other performative actions to occupy their time. That is, until recently. Now it seems that planking has re-emerged in perhaps one of the least memey areas of contemporary culture — FITNESS! Apparently, you can Plank Your Way to Better Abs. A Google Search for “Planking Exercise” returns 445,000 results, while “Planking Meme” returns 500,000. It is interesting to note that the “plank exercise” predates “planking” the meme. But, it seems that the “plank exercise” has gone through some rebranding since the emergence of the meme. That said, the histories of the meme — which arose out of either playing dead with origins in South Korea, or from the Lying Down Game from England — is confused. The term planking itself comes from Australia. Though there are similarities between planking the meme and planking the exercise, there are substantial differences. 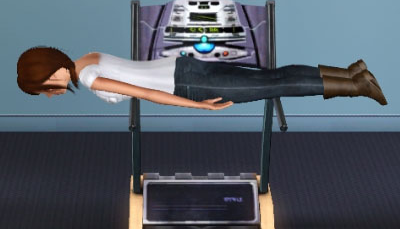 The image at the top of the page, which is in fact a Sims avatar planking, demonstrates the positioning for the meme. The image to the left is related to the exercise. As you can see the positionings are quite different. So, it would seem that adding the -ing at the end of plank for the name of the exercise is an effect of the meme’s presence in contemporary culture. The procedures differ as well. You must make it known that you are Planking. Saying ‘I am Planking’ usually get this across. Sternly announcing it will ensure a good result. Your safety should always be considered. Properly thought through Planking procedures should always go to plan. Never put your self at undue risk. Every Plank that is captured must be named. A demonstration of the planking exercise. From the perspective of a memester or photo fadder, these fitness folks are just doing it wrong. Much closer to the procedure of the meme, are acts of prostration. Sans the necessity to naming and capturing the performative act. Still, this brings up questions of (emptied) religiosity in both the meme and the exercise. This entry was posted in Ideas, Memey Bits. Bookmark the permalink.